Companies showed off over a dozen new rivals for the iPad at Computex this year, including a nifty 10-inch touchscreen tablet that docks into a speaker from Compal Electronics. The number of tablets at Computex Taipei 2010 pays testimony to the trend Apple set in motion in April. Now that the company has sold 2 million iPads in just under two months, PC vendors globally want a piece of the action. In the weeks leading up to Computex, it appeared Google might sweep the show with Android-based tablets, but Microsoft swooped in with some key victories and the launch of Windows Embedded Compact 7 software for small devices. One company that says it will make tablets using Android, Windows and the MeeGo software developed by Intel and Nokia, also showed off one of the neatest devices at Computex, complete with its own user interface (UI) and speaker-dock. Compal Electronics, the world's second largest contract maker of laptop computers, unveiled a sleek Android-based tablet with a 10-inch touchscreen and a stereo speaker it docked into. The UI is similar to Acer's Shell UI, which works on Android smartphones. The UI simplifies navigation by making the home screen a room full of objects the user taps using the touchscreen. Tapping a stereo icon, for example, starts music playing. Demand for tablets has risen thanks to the iPad, Compal CEO Ray Chen said at the show, adding that, "we have a lot of customers that are very interested in tablets." 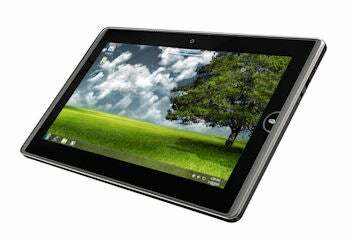 The company's tablet uses Android version 2.1 and is on offer to PC vendors worldwide. Compal creates designs for vendors to choose from, then manufactures the devices at factories in China. Acer, the world's second-biggest PC vendor, offered a glimpse of its own prototype Android tablet just prior to Computex, at a news conference in Beijing. It has a 7-inch display and a keypad, but Acer didn't say when it might be released or how much it will cost. 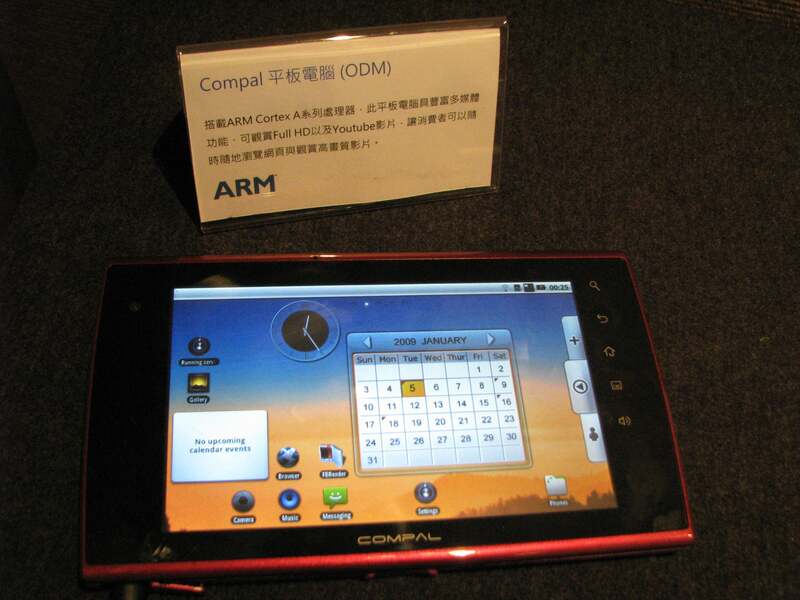 Several smaller Taiwanese and Chinese companies had Android-based tablets at their Computex booths, including Browan Communications, Firstone Technology, Digitran and FuJian Sanxi Electronics. Arm Holdings, which designs the processing cores popular in Android devices, estimates there will be about 40 tablet devices made using Arm-based processors this year, and several e-readers. "Android has become remarkably popular in a short space of time," said Tudor Brown, president of Arm, at a news conference in Taipei. Foxconn's N928-1 with a 10-inch touchscreen, the Lifepad by Prowave with a 7-inch touchscreen and Wanlida Group's Malata brand tablet with a 10-inch touchscreen. Micro-Star International (MSI) also showed off an Android-based tablet PC called the Wind Pad 110 at a news conference, but the company will launch a Windows-based tablet first, a strategy some of its rivals also announced. MSI's Wind Pad 100 has Microsoft's Windows 7 on board, a 10-inch display and a UI developed by MSI. It also features built-in 3G and Wi-Fi, GPS and HDMI high-definition video output. It will be available later this year. Asustek Computer (Asus) also debuted its first tablets, two Eee Pads running Windows software. A tablet PC from Asustek with Android on board was displayed at the International Consumer Electronics Show (CES) early this year, but the device did not appear at Computex. Asustek Chairman Jonney Shih said he's not sure the market is ready yet for Android-based tablets. Shih said the launch of the iPad has created a unique opportunity for tablet-style devices and he expects demand for such products to grow this year. Apple launched the iPad on April 3 in the U.S. and last week started selling them overseas in markets including Australia, Germany, Japan and the U.K.
Computex is one of Asia's largest electronics trade shows. The exhibition usually offers a view of what products consumers will see on world markets later this year.